Quite often I will come across the same set of questions asked around on whether it might be okay for parents to get a fish tank for their children and what type of setup that will fit everything in terms of ease of care, maintenance and at the same time fulfill the fun and enjoyment part. If you have an interest going into the fish keeping hobby but at the same time have family with children to take care of, obviously there are a lot of questions pertaining as to whether you might have enough time to manage all that and there are several things that will come into mind about making the right decisions. Thus the article here is a compilation of all the common questions and hopefully putting my best effort to answer it will help to clear some doubts. How do I make sure that the aquarium setup is safe for my kids? Aquarium is a very fragile container designed to hold huge amount of water. Don’t be surprised that a fully filled 10-gallon tank can easily weigh anywhere between 80 to 100 pounds depending the level of the water plus overall material of construction. There are basically two different types of material used to build the tank, one which is acrylic (much stronger) and provide a clearer see-through view plus higher transparency rating while the other one is a glass type. In terms of costs consideration alone, of course the glass is much cheaper as that would fit really nice matching your budget but if you have children, I would suggest getting acrylic instead because safety is a major concern here. There have been numerous incidents such as glass tank leaking after some time, wetting the floor and potentially causing short circuit (if it comes into contact with electrical equipment) while other possible scenario is that cracks will appear due to negligence cause by children hurling objects and accidentally hitting it. As such depends on whether you are willing to go extra mile and spending extra, I would suggest that you consider the option on getting acrylic aquarium. What are the types of fish which require low level of maintenance? Oh, there are endless list of fish that I would come up with and I could actually spend the whole day talking and talking non-stop about this subject. But first of all before moving on further, what I’ve always told people was that depending on your knowledge and what you know about fish keeping, always consider getting the type of fish suitable based on your level of experience. If you are beginners then what you definitely need are those pets which are hardy with low requirements and maintenance and generally fish like betta, guppies, all fit into these criteria. Forget about demanding and buying based on instincts and what your heart’s desire dictates because those are always the biggest mistakes. Once you have gained more experience, you can start to consider keeping other types of pets such as goldfish (don’t underestimate, they are difficult to maintain), freshwater sharks, angelfish and even discus. For more information, read about choosing the best pet fish for kids. I intend to get a small-sized tank, around 5-gallon range. Would that be okay? Generally I’m always all out against the idea on buying a small tank. Although there are fish such as neon tetra, rasbora and even pencilfish that will fit into the confined limited space, however, what you do not know is that you are hurting your pets in the process. 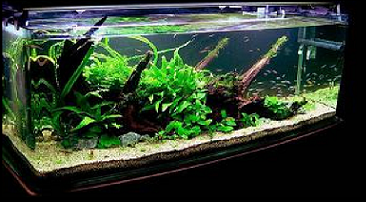 Small tanks with such low quantity of water, complicates control of aquarium parameters as you try considerably hard to maintain at certain ideal range. The fact is, water parameters such as pH, temperature, nitrite and nitrate levels will keep on fluctuating because the slight change will cause a huge effect with that amount of water available. For example, imagine putting a teaspoonful of salt into a bucket to and trying to taste the water, of course you won’t even notice the change at all but if you are diluting the same teaspoonful into a small drinking cup, imagine what the effect is like. The point that I’m trying to convey is that with lesser amount of water, the harder it gets to control the water chemistry and changes taking place in the small-sized tank. Is there any extra precaution that I should take to safeguard the aquarium? I’ve read real stories about children emptying a box of cereals to feed the fish including incidence of trying to catch the fish using a net and then putting on their palm. Children can always come up with all sorts of funny interesting ideas and I can tell you that they are indeed creative. In terms of location and access point, first of all, by all means get a sturdy and tall fish stand that will keep them out of reach. If you have made up your mind on getting an acrylic aquarium as per suggestion above, that will provide another plus point, but one more thing you shouldn’t miss out is getting a tank that comes complete with a proper hood. This will at least deter them from trying to open the hood and do some funny things but anyway, this is just a short term solution as the most effective approach that goes a long way is trying to educate them about proper sense of responsibility and love of living creatures. Thinking of something different and out-of-the-box ideas? How about having something special like the unique fish bowls.